Many people assume that cosmetic treatments are done exclusively on women. However, cosmetic treatments for men are becoming increasingly popular, and for several good reasons. Maybe you got a tattoo that you thought you’d love forever but now you can’t stand the sight of it. Perhaps you’re not feeling as confident about baring your beach body. Or maybe you want your skin to look a bit younger and fresher before you go after that big promotion. No matter what body issues you’re focused on, Chances are we’ve got the answer at The Langdon Center for Laser and Cosmetic Surgery, located in Guilford, Connecticut. Laser Hair Removal: Sick of relying on your razor to get a sleek, hair-free look? Laser hair removal is safe, effective, and requires no downtime. The Langdon Center uses the fastest and most comfortable hair removal laser available: the Palomar Vectus. Our laser hair removal treatments are effective even on large areas such as chest, back, and shoulders. Laser Tattoo Removal: Want to get rid of the tattoo that’s constantly reminding you of 1996? At The Langdon Center, we use the advanced PicoSure picosecond laser as well as a special “Q-switched” laser, both of which causes the tattoo ink particles to break apart. We are able to remove tattoo ink of nearly any color. As the body removes the particles, the tattoo fades over time, allowing your natural skin tone to reappear. 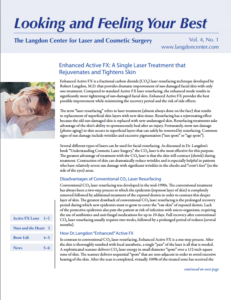 Laser Skin Resurfacing: As one of the most experienced cosmetic laser skin surgeons in the country, Dr. Langdon typically uses the UltraPulse laser for full-face resurfacing. This treatment is ideal for clients who want to replace their old, sun-damaged skin with a bright and fresh and tighter complexion. Laser skin resurfacing is also a great option for patients who want to look younger. For minimal-downtime resurfacing, we offer fractional treatments with the Palomar ICON non-ablative laser system.